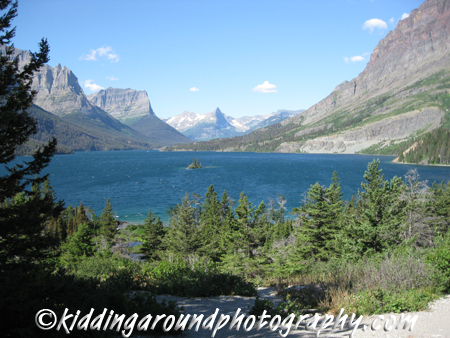 Most people visit Glacier National Park in the summer, which is when we’ve been before as well. But this year we’re off to Glacier for spring vacation! We’re doing a home exchange and hoping to find some snow to try out our new snowshoes. Whatever we find, we know it will be beautiful because you just can’t go wrong at Glacier National Park. 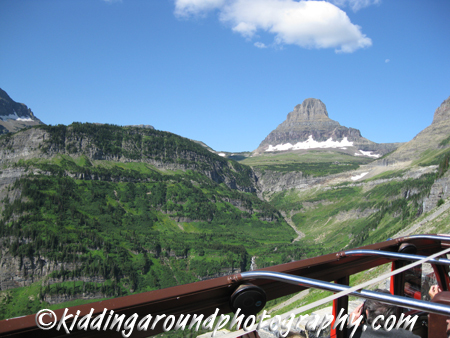 The last time we visited Glacier was on a nibling 13th birthday trip and we had a ball. We camped and hiked and watched mountain goats and grizzly bears. We got our junior ranger badges, of course, and we went on a horseback ride. 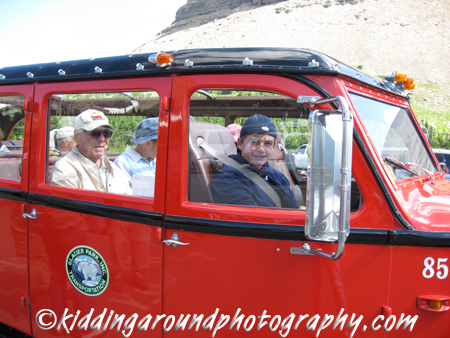 But I think the highlight of the trip was a ride in the famous Glacier Red Buses over the Going-to-the-Sun Road. This was one of our two splurges for this otherwise super budget friendly trip and it was well worth it. Red bus ready for action! We did the Crown of the Continent Red Bus Tour which lasts 6-8 hours and costs $60-90 depending on where you’re picked up (children ride for half price). There are shorter (and less expensive) tours available as well. Not a bad view if you’re stopped for road work! The Red Buses themselves are pretty amazing. First off, the’re not really buses, they’re long cars that have a Rolls-Royce-y look. They were designed in the early 1900s and all of the buses in the current fleet are from the 1930s so are truly vintage automobiles. They’re painted the bright red of Glacier’s Ripe Mountain Ash Berry, accented with black, and polished to a high shine. If you’re into cars, you might be interested to know that the buses have oak, not metal frames. For less environmental impact, they run on a mix of gasoline and propane. But the best part about the Red Buses is the top that rolls back to give riders a view like no other. And the provided blankets to keep the chill off are a pretty nice touch. 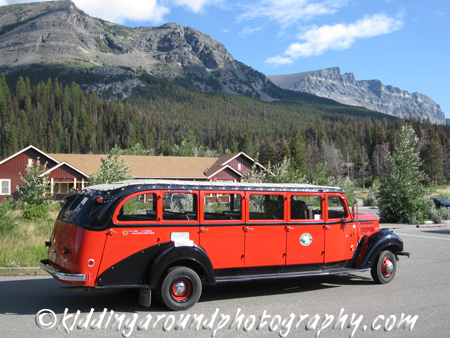 The drivers of the Red Buses are called Jammers for the way they used to jam the gears when going up over the Going-to-the-Sun Road, and they take incredible pride in their vehicles and in the tour. They’re full of information about every aspect of the park that they share throughout the journey. They know the best photo stops and will also take your family photo if you want them to! Our driver let the kids on the trip take turns sitting in the front seat and help out with rolling back the top, too, adding an extra element of fun for the kiddos. 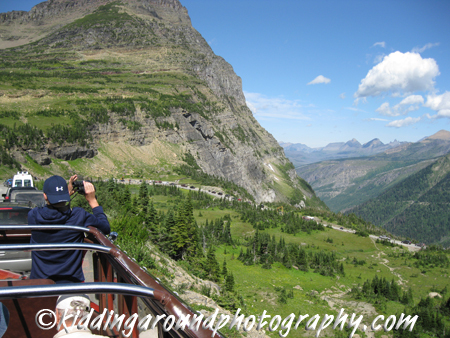 You can drive the 50 miles of Going-to-the-Sun Road in your own vehicle (there are some vehicle size restrictions), but it’s a narrow, winding road and at the very least the driver, and sometimes the backseat driver co-pilot, don’t get to sit back and enjoy the majesty of this drive. Riding with a Jammer at the wheel, all you need to do is sit back and look up. You’ll understand why Montana is called Big Sky Country after one of these trips! For nearly a full day’s worth of information and entertainment, we think the Red Bus Tour is worth a splurge. Have you done a Red Bus tour? Give us your thoughts in the comments, and enjoy your next trip to Glacier, whether it’s for a week or a weekend! Ha! Hadn’t really thought about that, Machelle.